Bottled water alternatives help you go with the flow—environmentally! Remember when bottled water was the hottest new product on store shelves? Suddenly we were lining up to pay at least $1 per bottle for a resource we had previously sipped for almost nothing. Not only is bottled water costly, it carries a hefty environmental price tag: Most bottles are made from raw materials derived from crude oil. The Pacific Institute calculates that average energy costs would be the equivalent to filling each bottle one-quarter with oil. Plus, at least twice as much H2O is required for production than what is bottled. Then there are greenhouse gas emissions from transporting the bottles. Recycling commands still more energy, though not all empties land in the blue box: bottles in landfill may take hundreds of years to decompose. Fortunately, greener options abound beyond the obvious refillable pitchers with washable glassware. Start by booking your event in a city with potable drinking water so you can take advantage of the huge savings—and small footprint—of tap water. Here are a few more green ideas. Giant refillable water coolers have been updated with insulated self-serve coolers that hook into the waterline and dispense filtered tap water. 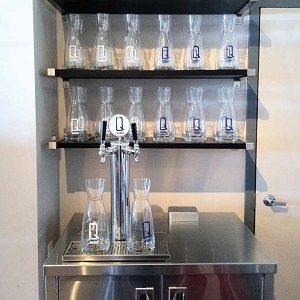 Chelsea Hotel, Toronto is minimizing its water footprint by serving Q Water. The mobile unit hooks up like a draft beer system, cycling tap water through a filtration process, which staff dispense into carafes. “You get fresh taste without any sodium or other additions,” says director of food and beverage Lars Friedriszik. For $1 per person, the Shaw Conference Centre in Edmonton (it boasts the highest rating for sustainability: five Green Keys) offers self-serve stations featuring tap water flavoured with fresh fruits, herbs or cucumber slices. “It’s a little nicer than a plastic water cooler but more sustainable than bottles,” says Manfred Kalk, Shaw’s client services manager. To hydrate 38,000 customers traipsing through the Green Living Show each year, Green Living Enterprises hires the City of Toronto’s mobile water truck. “It has multiple stations to fill water bottles, plus spouts like a drinking fountain, so it’s great for hydrating thousands of people,” says Green Living Enterprises vice-president Robert Orlovski. If reusable glasses or bottles aren’t realistic, the next best thing is biodegradable cups coupled with a composting program. Companies such as Green Shift (greenshift.ca) or Core Sales (coresales.ca) sell cups derived from plants, not petroleum. Some delegates insist on bottles. Listel Hotel, Vancouver’s five Green Key-rated boutique venue, sources locally-bottled water from BC instead of jet-setting imports from Fiji or the French alps. Innovative bottlers are also switching to greener packaging. Flow’s boxed spring water from Southwestern Ontario boasts the lowest carbon footprint in the industry. Happy Water (livehappywater.ca) is sourced in Canada and packaged in recyclable boxes or biodegradable plastic bottles.